Wander into Serenbe in the Chattahoochee Hills (Chatt Hills to locals) south of Atlanta, stop for a sweet or snack at the Blue Eyed Daisy and you may think you’ve stumbled into a Brigadoon of sorts. The only thing friendlier than the respect for the environment are the residents, all of whom seem to know one another. Strike up a conversation or kick around a soccer ball with the kids out back and you’ll want to join them. Fortunately, you can. Unlike Brigadoon, Serenbe isn’t going anywhere. The Inn at Serenbe has become a favorite destination for corporate retreats, singles or families getting away from the city. It’s all the vision of Marie and Steve Nygren who believe if you want to change the world, start in your own backyard. Theirs is acre upon acre of rolling, wooded countryside. Speaking of acres, the 25-acre organic farm provides produce for the three restaurants - The Farmhouse, The Hil (Warning: Chef Hilary White's french fries are addictive) and Blue-Eyed Daisy - as well as residents and visitors at Saturday morning farmers' markets. The Serenbe Playhouse is currently presenting productions of “The Wizard of Oz” and “Oklahoma!”. I can personally vouch for the latter. Word is out about this quality show in a unique outdoor setting so make reservations early (it's scheduled to run Thurs-Sun. through mid-August). 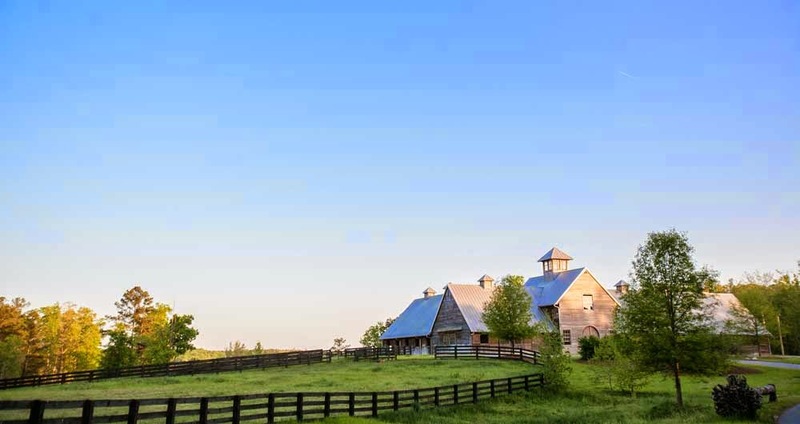 Beyond the environs of Serenbe are charming country roads and local places to eat that will take you back to another era. Explore and enjoy. 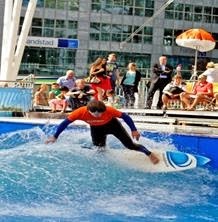 Just when you thought you’d seen everything at airports, Munich, Germany’s is back with Surfing (!) today through August 24. August 9-10 you can catch the European Wave Riding championship. Assuming your flight is on time – or not, I guess. If you already know how to surf, it’s free to try the waves but advance registration is required, http://www.munich-airport.de/surfandstyle. There’s still time to book a luxury camping trip in Yellowstone National Park this summer. 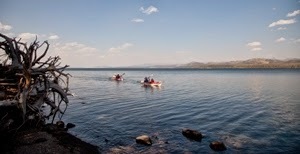 Far and Away Adventures offers two-night camping trips in Yellowstone Lake’s back country with guides to do the setup of carpeted tents, air mattresses on raised platforms and handle the upscale food prep and service, not to mention show you parts of the park few get to experience. Raft West Virginia's New River Gorge. What: Raft 2-for-1 Special. 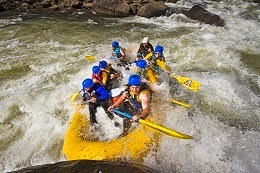 Reserve an all-day Upper or Lower New River rafting trip at $139 and get a second trip free. Rather stay longer? There are special packages available for that, too. Where: Adventures on the Gorge Resort, near Fayettville, West Virginia. Small print: Does not include taxes, fees or gratuities. Pick your favorite part of North Carolina ans find a special package.